After reading the first two novels in Archer Garrett’s dystopic Western Front series, I decided to have the author, Archer Garrett answer a few questions so my readers may get to know him. Thanks for having me. Glad to be here. 1 – This is a type of novel that is becoming more popular in these difficult times. Did the times inspire you to write or did it simply influence the type of novel you wrote? Both. I’ve always liked dystopic books and movies, and I’m certainly aware of the how the world is changing around us (I mean, who isn’t these days?). I suppose you gravitate towards settings you are comfortable in, so that’s how I wound up with my setting. 2 – What was the first piece of writing you did that made you realize that you wanted to be a writer? What was your ‘eureka’ moment? 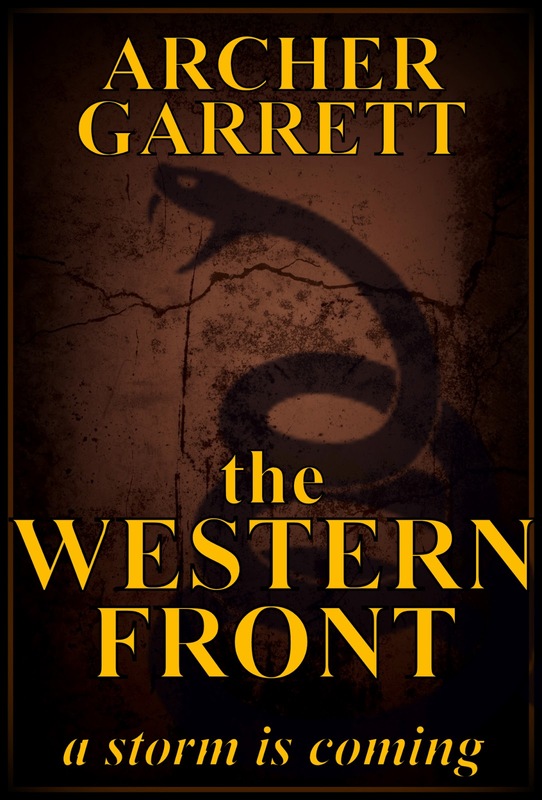 The Western Front (TWF) was my first project, written in 2012 – though it wasn’t near as well-written as it is now. Don’t get me wrong, I’m not calling myself an expert at the craft, but I have learned so much in the past year. Almost on a whim, I wrote the first two chapters of TWF in early ’12, and then put it down. I didn’t really have a direction of where to go with the story, nor a desire to blindly push forward. Several months later, I came up with the character Clayton Sellers. I enjoyed him so much that I just kept writing. Five books in the series later, here we are. 3 – Are your characters inspired by particular people, composite characters or totally works of your imagination? The Sellers family and my own share a lot of similarities. TWF originally started out as a story about the two brothers and grew from there. Reese (one of my favorite characters) is probably a composite from way to many spy novels, shoe horned into a dystopic book. 4 – What writers inspired you as a child? Which ones inspire you now? The two I probably read the most were John Grisham and Robert Ludlum. I loved having been to the places Grisham wrote about and always admired the way Ludlum told a story. I came across Cormac McCarthy maybe a half-dozen years back and was blown away by his prose. I’m just a throwaway writer, but that man is a literary genius. Here’s an excerpt of his from Blood Meridian. 6 – What advice do you have for young writers wanting to start out? …But it ain’t easy. If you ever want to finish a book, treat it like work – because it is. Hard work. Set goals. Follow through. Write a little every day to develop and retain the habit. Get someone you can trust for an honest opinion to read your works in progress. And break out all those old books you love. Read them again with an eye for what made you love them. I don’t mean the story. Study the author’s prose, the words they used, how they built suspense, etc. Then copy it shamelessly. 7 – What about older or middle aged writers who feel it is too late? Everything above still applies, but you’ve got one foot in the grave. Giddyup. 8 – What are you working on now? Will we see more of the same or will you take your writing in a new direction? I’m working on book two in my zombie series, the Blighted. I’d also like to write a follow-up to a steampunk novel I wrote, Pulse Chaser. I had more fun writing PC than anything else. If it sold better, I would write exclusively in its universe. 9 – Anything else you would like to share with us before you go? Buy on the dips, always keep an eye on the exits, and get up and do something – ain’t none of us promised tomorrow. This entry was posted in Author Interviews and tagged archer garrett. Bookmark the permalink.